Topps announces an exciting new 13-card Autograph Insert called "2 OF A KIND", which highlights Topps Spokesman and baseball icon Alex Rodriguez. 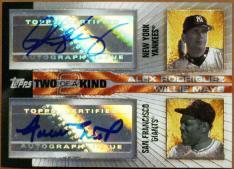 The first exclusive "2 OF KIND" Autographed card will feature Alex Rodriguez and baseball great Willie Mays. The stunning card, which is printed on Dufex technology, will be seeded into packs of 2004 Topps Pristine Baseball (October 6th). The card is sequentially numbered to A-Rod�s uniform number, 13. Twelve other "2 OF A KIND" Autographed cards will follow and be included into upcoming Topps Baseball products. Like the A-Rod/Mays card, each of the remaining cards in the set is limited to just 13 copies and will feature dual autograph subjects such as Alex Rodriguez/Hank Aaron, Alex Rodriguez/Cal Ripken Jr., Alex Rodriguez/Mike Schmidt and nine other stellar combinations to be announced at a later date. Last July, Rodriguez inked a deal with Topps to issue his exclusive autographed baseball cards and game-used memorabilia cards.